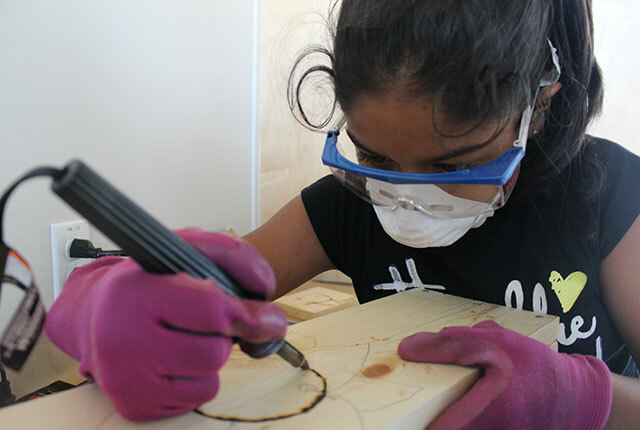 DIY Girls is partnering with Harbor Freight Tools for Schools to provide a free summer woodworking camp for underserved students that will engage them at an early age in STEAM (science, technology, engineering, arts, and math) and the skilled trades, while also helping to build the workforce pipeline where women are significantly underrepresented. Woodworking– Participants build wood planters using hand and power tools, including table saws, hammers, drills, tape measures, and clamps. Each girl is given a single plank of wood measuring 8 ft by 1 in and is required to utilize mathematic concepts and the prototyping process to ensure she has enough materials to construct her ideal planter. Gardening– Participants learn how to germinate seeds, plant seeds/sprouts, and healthy recipes that utilize what they grow. These interdisciplinary experiences demonstrate the interconnectivity of the environment, food and individual health. Healthy Eating– Participants use the engineering design process to identify health issues in their community, including diabetes, high blood pressure and obesity. They also engage in discussions about the availability of different types of food within their household. In addition, girls learn about the concept of “food deserts” and the close relationship between what we eat, the environment, and our health. technology, promote self-confidence, and support aspiration to technical careers. grown to serve 650 girls per year across 10 school sites and in the community. Note: Harbor Freight Tools for Schools is supporting DIY Girls through its support of Social and Environmental Entrepreneurs. Congratulations to the 2018 Prize Semifinalists!